In the first there appears to be a windblown pattern going from the pit to the west. This is generally in the downhill direction, so maybe we are looking at a lava flow pattern? 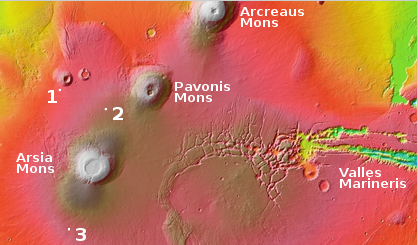 The second pit, located between Arsia and Pavonis Mons, is the smallest, but it also has a second pit nearby, to the northwest in the downhill direction. The alignment of the grade and location of these two pits suggest they are linked by an underground tube. If you look at the full image you will see that all the surface features follow this same alignment. 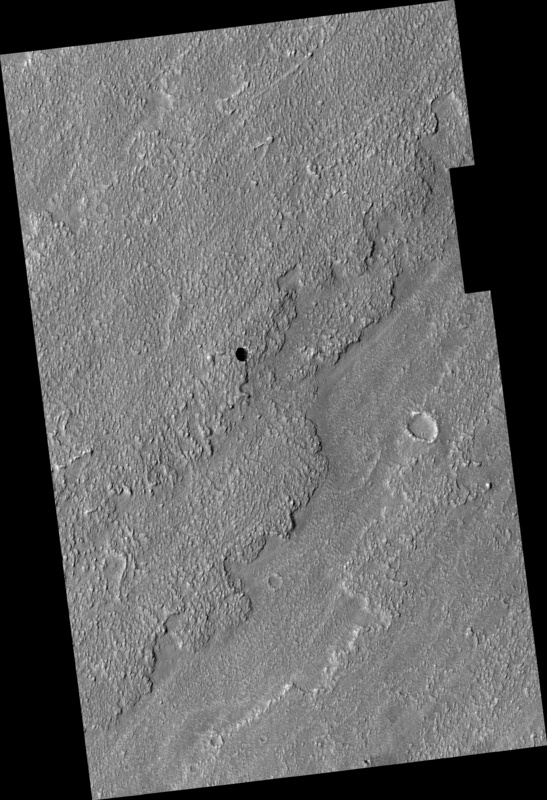 The image resolution however is not good enough to show whether there are any passages leading off below the rims. The third pit too has features linking it to the downhill grade. In this case the grade goes from the northeast to the southwest. 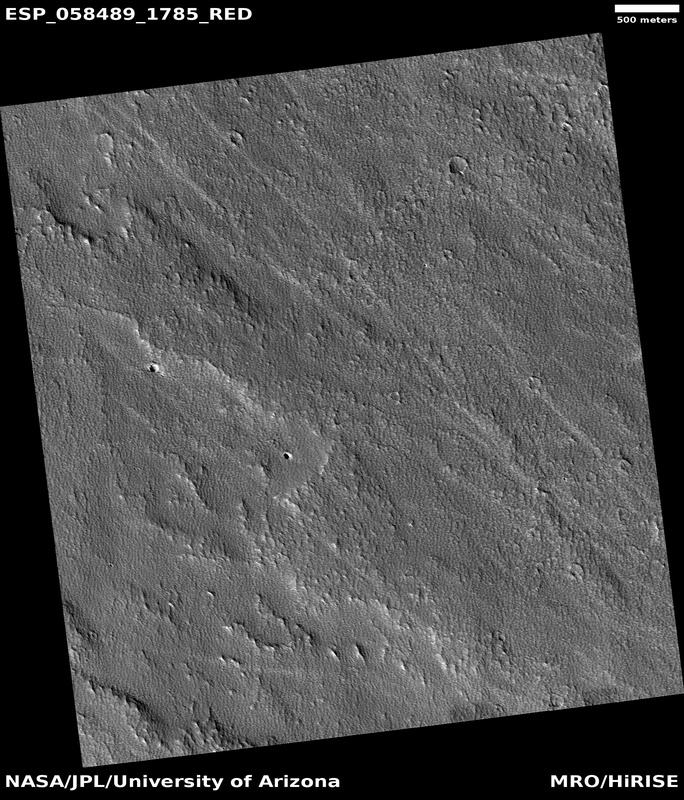 In the full image the pit sits on the northwest edge of a shallow canyon flowing to the southwest. It almost appears to have been a resurgence point into that canyon. Or not. The manner in which lava flowed once on Mars remains an on-going scientific question, one that pertains directly to explaining many of the geological features we see today. 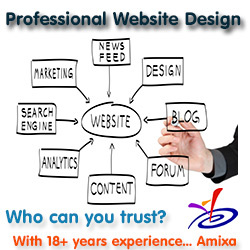 And since we can only see most of these features from a great distance, our knowledge base for answering this question remains somewhat limited. 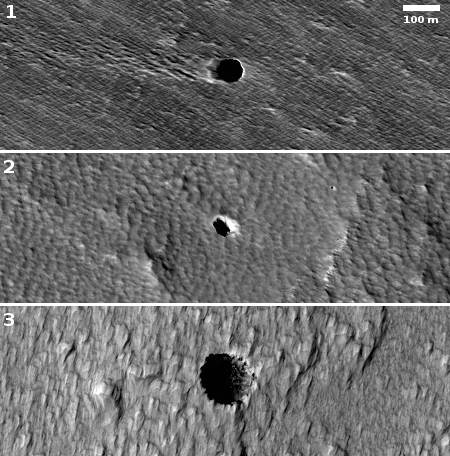 All of these pits however remain important targets for future exploration, as there is evidence that water ice might still be found within them, and building a colony underground has many many advantages, even if there is no water therein. Here however there might very well be water too.